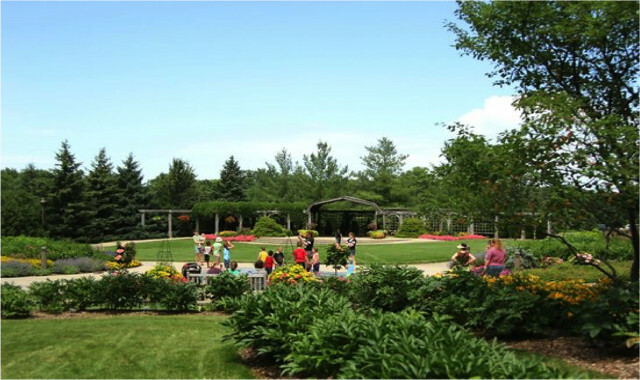 Learn about Midwestern native plants on Sept. 12 at the Klehm Arboretum & Botanic Garden. Through Aug. 26. Learn how to grow food organically, turn compost, plant, harvest, prune and more. Angelic Organics Learning Center, 1547 Rockton Road, Caledonia, Ill. (815) 389-8455, learngrowconnect.org. Aug. 12-14, 9 p.m.-12 a.m. Watch the most active meteor shower of the year. Bring a lawn chair or blanket. Byron Forest Preserve, 7993 N. River Road, Byron, Ill., (815) 234-8535, byronforestpreserve.com. Aug. 15, 1-4 p.m. Lesson on identifying different species of bumblebees followed by bee watching in the garden. $6 adult; $3 seniors, kids and students with ID; members free. Klehm Arboretum & Botanic Garden, Rockford, (815) 965-8146, klehm.org. Aug. 20, 7-8 p.m. Discover what owls eat by dissecting an owl pellet. $15/$12 members. Midwest Museum of Natural History (MMNH), 425 W. State St., Sycamore, Ill. (815) 895-9777, mmnh.org. Aug. 20, 7-8 p.m. Professor Kimiko Gunji on the features of traditional Japanese culture and arts that have influenced the country’s contemporary daily life and industry, performance of a tea ceremony. $5/members free. Anderson Japanese Gardens, 318 Spring Creek Road, Rockford, (815) 229-9390, andersongardens.org. Aug. 22, 9-10 a.m. Walk amongst a wide variety of wildflowers in bloom. Byron Forest Preserve, Byron, Ill., (815) 234-8535, byronforestpreserve.com. Aug. 22, 11 a.m.-4 p.m. Food, festivities and a kid-friendly workshop on Wycinanki – folk art paper cutouts. $7 adult; $5 kids; members free. Midway Village Museum, 6799 Guilford Road, Rockford, (815) 397-9112, midwayvillage.com. Aug. 29, 5-10 p.m. Enjoy local food and wines in a beautiful setting. Benefits Klehm Arboretum & Botanic Garden, Rockford, (815) 965-8146, klehm.org. Sept. 10, 7 p.m.- 8 p.m. Rock Valley College art professor Matthew Vincent talks about printmaking and its place in modern and contemporary art. Free. Rockford Art Museum (RAM), 711 N. Main St., Rockford, (815) 968-2787, rockfordartmuseum.org. Sept. 12, 9 a.m.-1 p.m. The Jefferson County Master Gardeners will present a seminar on Lavender. Free. Hoard Historical Museum, 401 Whitewater Ave., Fort Atkinson,Wis. (920) 563-7769. Sept. 12, 10-11 a.m. Alan Branhagen on Midwestern native plants and how to incorporate them into your landscape. His new book will be available for purchase. Klehm Arboretum & Botanic Garden, Rockford, (815) 965-8146, klehm.org. Sept. 12, 9 a.m.-5 p.m. More than 120 vendors selling vintage, re-purposed and handmade goods. Live music and food available. $8 adult; $5 child; members and children under 8 free. Midway Village Museum, Rockford, Ill. (815) 397-9112, midwayvillage.com. Sept. 12-Nov. 14. Hear scintillating tales from paranormal experts, listen to audio clips found in Tinker Cottage, enjoy a tour with the chance to have your own paranormal encounter. $25. Tinker Swiss Cottage, 411 Kent St., Rockford, (815) 964-2424, tinkercottage.com. Sept. 17, 7-8 p.m. Dr. David Slawson on aspects of universal landscape art developed in Japan. $5/members free. Anderson Japanese Gardens, Rockford, (815) 229-9390, andersongardens.org. Sept. 18, 7-9 p.m. Twilight wine tasting, live music, twinkling lights, light hors d’oeuvres. First 200 to register receive wine glass. $25/$20 members. Klehm Arboretum & Botanic Garden, Rockford, (815) 965-8146, klehm.org. Sept. 25, 7-11 p.m. 95.3’s Jeff Andrews will aim to stump you and your friends with a variety of fun questions. Snacks and cash bar available. $20/$15 members. Burpee Museum of Natural History, 737 N. Main St., Rockford. (815) 965-3443, burpee.org. Oct. 15, 7-8 p.m. John Powell on the famed Adachi Museum of Art located in Yasugi, Japan. $5/members free. Anderson Japanese Gardens, Rockford, (815) 229-9390, andersongardens.org. Oct. 22, 7-8:30 p.m. Dissect a creepy-crawly. $18/$12 members. Midwest Museum of Natural History (MMNH), 425 W. State St., Sycamore, Ill. (815) 895-9777, mmnh.org. Oct. 24, 6-8 p.m. Trick-or-treat throughout the decorated museum, have your photo taken with live critters, check out the grossology lab, enjoy games, candy, prizes and more. $8/$6 members. Midwest Museum of Natural History (MMNH), 425 W. State St., Sycamore, Ill. (815) 895-9777, mmnh.org. This entry was posted on Thursday, August 27th, 2015 at 11:57 am	and is filed under Mind & Spirit. You can follow any responses to this entry through the RSS 2.0 feed. Both comments and pings are currently closed.